Now's the time to get your local jewelry stores on a significant contract as my client the South Bend Tribune just did. 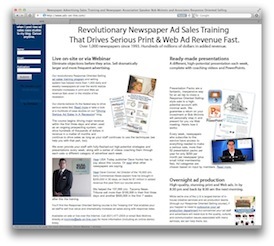 This is a 5 col x 18" ad sold on a 13x contract and includes a healthy Web component, too. There's no reason you can't sell a similar ad contract to your local jeweler as well, even if they're running nothing now. This one hadn't been running at all for at least a year after finding they could get the same low response rate from broadcast at a much lower price. Sound familiar? The problem with most local jewelry stores is that they're not correctly positioning themselves in their market. They're losing business to the big chain stores who, despite their lack of service, still have the great prices and selection buyers love. The local guys try to go with their own strengths, often making the focus of their ads mainly about trust and knowledge and other service-related issues and less about selection and price. Unfortunately, it leaves readers believing there's a real tradeoff when choosing between the local and chain stores. In effect, the message is: You can get a great price and selection or you can pay more for service, but you can't have both. In reality, most local jewelers tell us that it's not a tradeoff at all, that they have a great selection, highly competitive prices, and offer fantastic service, too. The ad above is the perfect ad to compete with the chains. It shows the incredible selection they have as well as competitive prices but also explains the exceptional service a customer will receive there. Instead of positioning themselves as nothing like the big chain stores, they communicate that they're everything like them in the ways the target customer cares about, but even better because of the service. So, how did we help this business see the light and sign a major contract when he wouldn't run anything before? By not just telling him what to do, but instead drawing out of him the information about his products, services, competition, and target customers as well as--based on his own life experiences--a new approach to creating direct-response advertising. Once we got buy-in in those two areas, it was easy to create (with the help of our designers) and sell the strategy based on them. Once you get it down, you'll be able to sell print and Web ads like this as fast as you can do your homework and create them. And it'll be the best thing you do for your advertisers, too.